On Saturday, 31st October 2009, the rededication of the Yorkshire County War Memorial for the Second Anglo-Boer War (1899 -1902), took place at the Garden of Remembrance near York Minster. More than a century had passed since its unveiling by Field Marshal Lord Roberts who had led the British Imperial forces in South Africa. Unlike the day of the unveiling ceremony itself, in the summer of 1905, the weather for the rededication was gloriously sunny as clergy and civic dignitaries gathered in Duncombe Place. 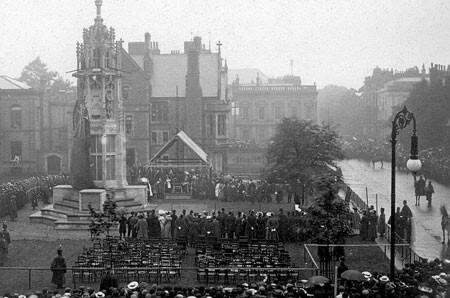 The rain poured down on 3 August 1905 during the unveiling ceremony of the Yorkshire County Memorial for the Anglo – Boer War near York Minster. This act of rededication and remembrance reminded me of a telling paragraph written by Rev. John Keble in an edition of the Bishopthorpe Parish Magazine. The publication date was October 1900; the South African War had started the year previously and was to last until 1902. We have received several letters from Privates G. Homer and A. Pickwell, giving most interesting accounts of their experiences in the war, and are very glad to hear that they have been preserved both from wounds and sickness. We hope that before long we shall hear of their safe return. Private H. Buckle was severely wounded and has returned home; we are pleased to hear that he is much better. Apart from this intriguing piece, the few surviving parish magazines of the period contain nothing else concerning the men’s plight. It is also frustrating that Rev. Keble did not give the names in full. Meurig G. M. Jones, ‘The Yorkshire County Memorial: A history of the Yorkshire County Memorial, York, for the Second Anglo – Boer War, 1899 – 1902’, in: York Historian, 12: 1995, pp 62 – 81.